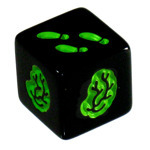 Daily Illuminator: Zombie Dice Is Almost Sold Out! June 14, 2012: Zombie Dice Is Almost Sold Out! Last week, we were shocked to find out that our third printing of Zombie Dice is almost gone. We suspect that the March release of Zombie Dice 2 - Double Feature, coupled with the game's appearance on the popular YouTube show Tabletop from Geek & Sundry, has generated a lot of new fans. Unfortunately, we didn't realize how fast the game was selling until it was almost too late. We've just placed a fresh order of Zombie Dice and expect new copies to be available in early October. We suspect that Zombie Dice will be completely sold out by mid-July. Luckily, we'll still have the Zombie Dice apps for fans to play and enjoy in the meantime. Of course, if you want more braaaaaiiiiinnnnnssss, you can always show your love of the game by picking up a Zombie Dice shirt from Warehouse 23.